Barack Obama wants to paint Mitt Romney as a man who can’t be trusted. 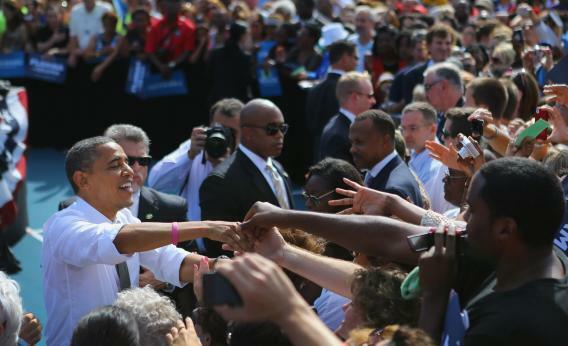 DELRAY BEACH, Fla.—President Obama moved from center stage to center court Tuesday. The day after the third and final debate, Obama started his day at a tennis stadium grinning under the waves of adulation from an eager and approving crowd. The night before, the president was all sharp elbows and crisp declarations about world affairs, but for those arrayed in the bleachers surrounding him on all sides, he was in full campaign mode, joking, switching accents, and returning to the perils of Romnesia—less Situation Room and more The Situation. The message is that if you think there’s something you like about Romney, he can’t be trusted to deliver. But Obama is also trying to redefine the race. It’s not about foreign affairs or the economy. It’s about trust. Gov. Romney has said the president has no ideas for the future, and even some of Obama’s allies make that charge. The brochure was the latest attempt to correct that impression. Obama had tried the night before too, making a few detours in the foreign policy debate to outline his domestic plans in bullet-point fashion. The agenda is not a mystery. Obama has been promoting it for more than a year: investment in manufacturing, education, infrastructure, energy production, and a trillion dollar start on shrinking the deficit. The American people either haven’t been listening, or don’t find what he’s selling very attractive. There is one other possibility. The search for Obama’s policies may be like a weekend trip to the refrigerator. You open it again and again, staring inside for a minute before you close it once more, unmoved and still hungry. Sometimes it takes another person to come along and point out that there really is something in there to eat, you’ve just been missing it. Republicans immediately dismissed the policies in the document as warmed over. True, but doesn’t that undermine the argument that Obama doesn’t have any plans? Being warmed over may be a disqualifying characteristic, but if old ideas are bad ideas, then Romney’s 20 percent reduction in tax rates is in danger. Marginal rate reductions are hardly a new idea. Indeed, it appeals to Republicans because it has a whiff of Reagan. When the president said that Romney shouldn’t be concerned about Romnesia because Obamacare covers pre-existing conditions, the crowd erupted with such delight that it felt for a moment like we’d been transported to one of those 2008 Obama rallies.